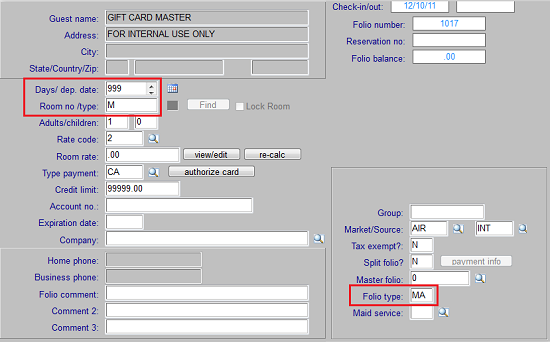 This document explains how to set up and configure Execu/Gift. Place the POS items on the keyboard (item entry) screen. At the following prompt select, "No - Guest is a walk-in". When the folio opens, enter the information. The number of days/dep. date should be 999. Room no./type should be M.
Folio type should be MA. You should never post directly to this folio except when it opens via the Execu/Gift program. The balance of this folio should be always zero. When a gift card is issued through Execu/Gift, the system posts a charge for the sale of the card and a payment for the means by which the card was purchased. 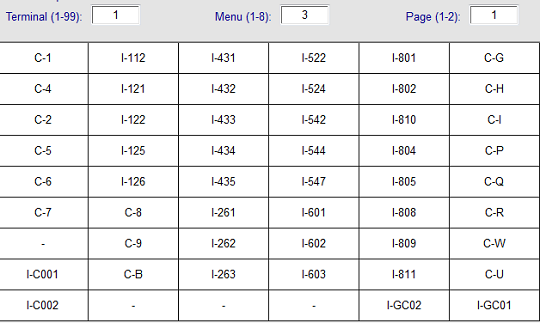 You should create the following Hotel charge codes: GCS, GCH, GCPO, GCRC. If you already are using any of these codes, check with Execu/Tech for alternative codes. See Charge code setup for detailed instructions. You should create the following Hotel payment codes: GCR, GCRD. if you already are using any of these codes, check with Execu/Tech for alternative codes. See also Payment code setup . The following line MUST exist for Execu/Gift to function properly. followed by the Gift Card master folio number, the charge code for the sale of the gift card, the charge code for the handling fee, the payment code for gift card redeemed (as a form of payment by the guest), the charge code for donated gift cards, the charge code for gift card sales charged to the guest's room (instead of the guest paying for the card at the time of purchase), and the charge code for POS gift card sales. These codes must be in this sequence and in this exact format, with no spaces and no punctuation other than shown. Each of these codes must be used, even if you do not use that feature. For example, if you do not donate gift cards you still need to include the charge code. * does not allow the user to create a donated gift card. There also are settings to allow Execu/Gift to track Activity deposits. This information will be provided within the Activities Help and Knowledgebase articles. Log onto POS Administrator and then select "Departments/ Revenue Centers" then select "Department Records." Set up the department code GF and point it to the Hotel charge code GCPO. See POS Revenue Departments/Revenue Centers for detailed instructions. Log onto POS Administrator and then select "Item Categories". You may use any code you wish. See POS Item Categories for detailed instructions. Log onto POS Administrator and then select "Menu Items". There are two ways to set up gift card sales in POS. The first way is manual pricing when the value of the card will be entered manually at the time of sale. The second way is to set a fixed price such as $25 or $100. Each card issued will have its value based on the fixed (automatic) price of the item. The image below shows how to set up the item for a manually-entered price. Note fields 21 through 28. The menu price is .00 and the (A/M) field is set to M. With this setting, when the item is selected for sale from the POS item entry screen, a popup will prompt for the price. The image below shows how to set up a fixed price (automatic) item. Note fields 21 through 28. The menu price is 100.00 and the (A/M) field is set to A. This means that if this item is selected for sale the price automatically will be $100 and cannot be changed. Note also the item description reads, "GIFT CARD $100". 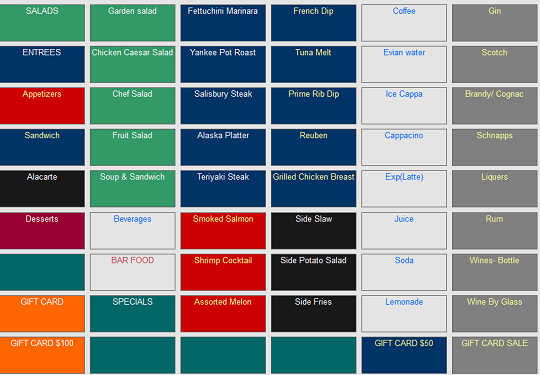 This enables the clerk, cashier, or server quickly to select the correct value card. See POS Menu Items for detailed instructions. Log onto POS Administrator and then select "Item Button (Keyboard) Setup". 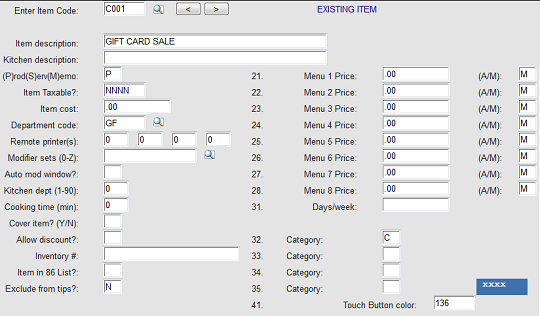 Set up the item button/ keyboard record for each terminal and menu from which you will sell gift cards. The image below shows how it looks on the item selection screen. See the bottom left two buttons. See Item Button (Keyboard) Setup for detailed instructions.